The goal of the grants is to support research that produces simulations of basic orthopaedic skills at the PGY 2-3 level that engage residents, are low tech and low cost. “As we look to the future of surgical education we want to find ways for learners to acquire surgical skills safely, efficiently and cost efficiently,” said J. Lawrence Marsh, MD, Senior Director of ABOS. 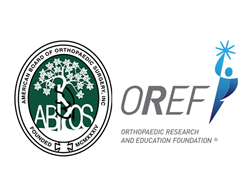 The Orthopaedic Research and Education Foundation (OREF) and the American Board of Orthopaedic Surgery (ABOS) are partnering to advance simulation as a tool for training orthopaedic residents. ABOS is providing funding for OREF to execute and administer $300,000 3-year grants that will support a simulation research and development program to assess the skills of a resident in training prior to the Part 1 board exam. As the orthopaedic specialty advances, the need for a cost-effective method for residents to hone basic skills in a stress-free environment grows. Simulators provide residents an environment in which they can practice and improve their skills without the stress of potentially causing harm. A recent study1 showed that orthopaedic surgery interns' and sub-interns’ written and skills test scores improved after completing a simulation module, but more research is needed to determine whether simulation could be used to assess orthopaedic residents’ performance prior to qualifying for their certifying exam. The goal of the grants is to support research that produces simulations of basic orthopaedic skills at the PGY 2-3 level that engage residents, are low tech and low cost so that they can be made widely available, have defined steps to obtain a set of benchmarks, and demonstrate that resident practice leading to benchmark skills would transfer to improved performance in the operating room. As a first step to apply for this grant, applicants are required to submit a letter of intent that concisely states the specific objectives and goals of the proposed research and summarizes the expected outcomes and the impact the research will have on the field of orthopaedics. For additional information about the grant, stop by the ABOS and OREF booths outside of Academy Hall, or visit http://www.oref.org/grants. The American Board of Orthopaedic Surgery (ABOS) is a 503(c)6 non-profit organization whose mission is to ensure safe, ethical, and effective practice of orthopaedic surgery. The ABOS maintains the highest standards for education, practice, and conduct through examination, certification, and maintenance of certification for the benefit of the public. For more information, visit http://www.abos.org. The Orthopaedic Research and Education Foundation (OREF) is an independent, 501(c)3 non-profit organization that raises funds to support research on diseases and injuries of bones, nerves and muscles and to enhance clinical care leading to improved health, increased activity and a better quality of life for patients. To further its mission, OREF is committed to exploring ways to partner with others to move the field of musculoskeletal research forward. For more information, visit http://www.oref.org and follow us on Twitter at http://www.twitter.com/oreftoday.